Earlier today in the Turkish Airlines-Prize of Europe jump off class, Bertram Allen finished in third spot with the 13 year old mare Molly Malone V. O’Connor placed fourth in this 100,000 Euro class on his stallion Good Luck. In a competition that was run under difficult conditions with high winds and rain at the infamous Aachen venue, a little over a tenth of a second separated the top four. It was Eric Lamaze (CAN) riding Fine Lady 5 who took the honours for the second year running. These successes add to Team Ireland’s recent run of exceptional results at 5* level. 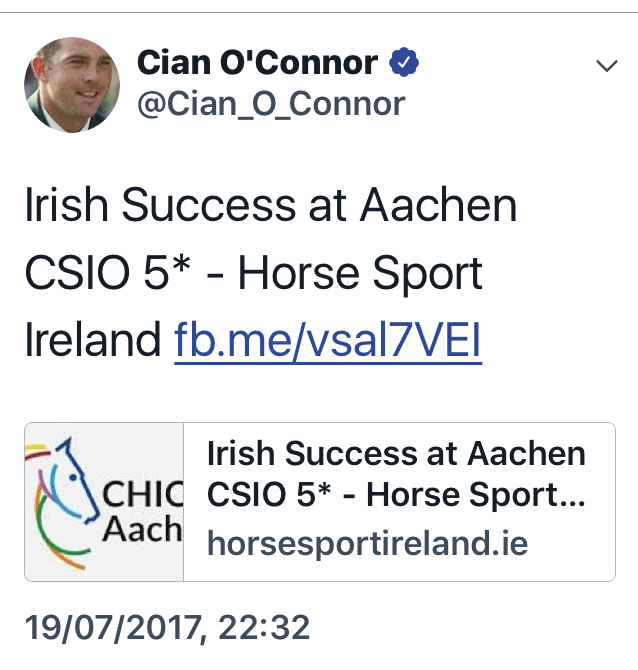 Ireland are well represented at the 5* World Equestrian Festival, CHIO Aachen not only by Cian O’Connor and Bertram Allen in Show Jumping but also with Judy Reynolds in Dressage and the Irish Team of Joseph Murphy, Elizabeth Power and Sophie Richards in Eventing.